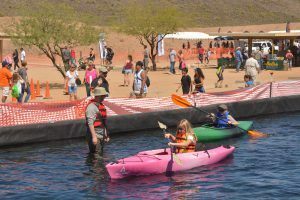 PHOENIX – Hit the water and take a short paddle around the 90,000-gallon kayaking pond at the Arizona Game and Fish Department’s Outdoor Expo, presented by Shikar Safari Club International. Admission and parking are free for the family-friendly, hands-on event, which runs from 9 a.m. to 5 p.m. Saturday, March 25 and from 9 a.m. to 4 p.m. Sunday, March 26 at the Ben Avery Shooting Facility, just west of Interstate 17 and Carefree Highway in Phoenix. Learn some basics, get some exercise and experience while paddling around the popular lake. The experience is designed to provide beginner or experienced kayakers a chance to try their hand at the paddle, while receiving a water safety lesson. That’s just a hint of the outdoor extravaganza that is the AZGFD Outdoor Expo. In addition to Lake Paddlemore, officials with AZGFD’s Off-Highway Vehicle program will be present to answer questions and provide information on how to ride safely and responsibly. ATV and side-by-side dealers will also be on hand with their latest machines for sale. Talk to experts about wildlife, hunting, camping and fishing tips or allow the kids to try their hand at the free catch-and-release fishing pond. Visitors can also see and learn about wildlife, watch horse-mounted shooting competitions, and try out firearms in a safe, controlled environment on the range (nominal fee charged for ammunition). There will be more than 150 exhibitors, including outdoor recreation and conservation groups, government agencies and commercial vendors of outdoor products and services. More than 41,000 visitors attended last year’s family-friendly Expo, so with picturesque weather on tap for the weekend, everyone is encouraged to visit. For the third straight year, the presenting sponsor of this year’s Arizona Game and Fish Department Outdoor Expo is Shikar Safari Club International. Gold sponsors are OneAZ Credit Union and Shooter’s World/Daniel Defense. Silver sponsors are Sportsmen’s Alliance Foundation, Sportsman’s Warehouse, FN Herstal, Cabela’s and Target Factory. For more information, visit www.azgfd.gov/expo.